Leveraging our rich industry experience, we are offering our clients a wide array of Square Scoop. We are one of the trusted and recognized organizations involved in manufacturing SS Scoops. - Size: 7" 8" 9" 10" 11" 12"
We offer clients a wide range of stainless steel scoops or SS scoops, which is available in open type and closed type in ss 316 quality material and has a capacity of ¼, ½, 1, 1. 5 and 2 kgs. 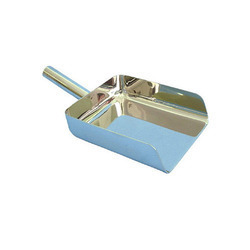 Accredited for our wide range of products, we are offering premium quality Stainless Steel Scoop. Scoops are used for transferring soil, cement, aggregate or any other grainy material or powders. They are made from 304 S.S. and fitted with handle. We are offering a wide range of SCOOPS & SQUEEZERS.They are made of stainless steel. Available in various designs and shapes, these products are highly acknowledged in the market. Size: 500 GRAMS, 1 KGS., 2 KGS. Question: 500 VGRAMS, 1 KGS., 2 KGS. 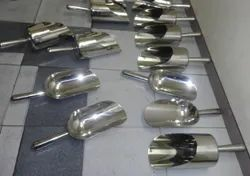 With our vast experience & knowledge in this field, we are engaged in manufacturing a quality-assured range of SS Scoop. - SS scoop half round model 1 kg to 0.250 kg 16 swg 316 – 304 quality as per customers' requirement mirror finish 320 grade finish. wing to its beautiful design, it is widely famous in the market.